Long-lasting all-rounder. The Aspire boasts a strong processor and gaming-suitable GPU — but users will not have to sacrifice long battery runtimes in exchange for its high-performance hardware. 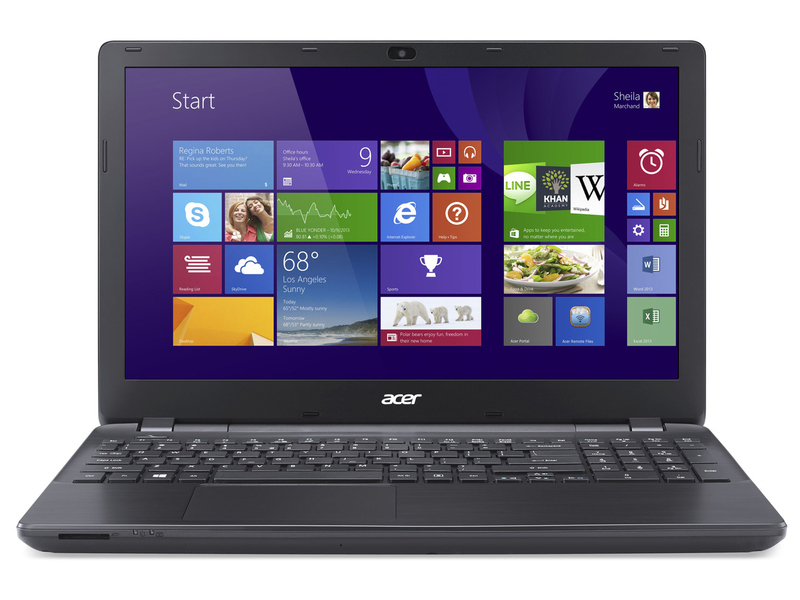 Acer offers 15.6-inch, all-around laptops within its Aspire E5-571G lineup. In the summer of 2014, we tested one member of this range in form of the Aspire E5-571G-536E. Now we have an updated version of this series with a new Broadwell processor in place of the earlier Haswell processor. Our report evaluates whether the new generation of processors provides an advantage. Some of the Aspire's rivals are Toshiba's Satellite S50-B-12U, the Asus X555LN-XO112H and Lenovo's IdeaPad Z50-75. Since both tested Asus models are identical in build, this review will not go in-depth about casing, connectivity, input devices, screen or speakers. 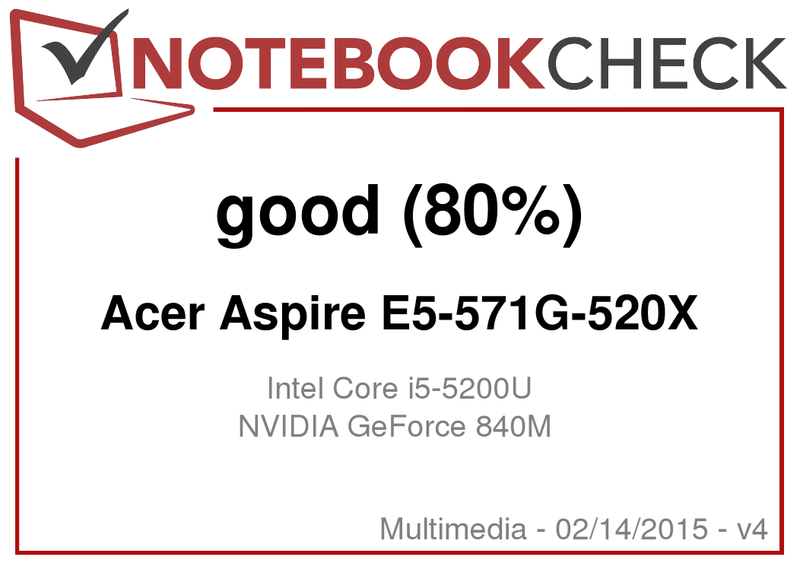 This information can be found in found in the Aspire E5-571G-536E review. Although both of the E5-571G models we tested feature the same screen, their rates differ slightly. This is normal: no two screens, even if they are from the same production batch, will ever be one hundred percent identical. 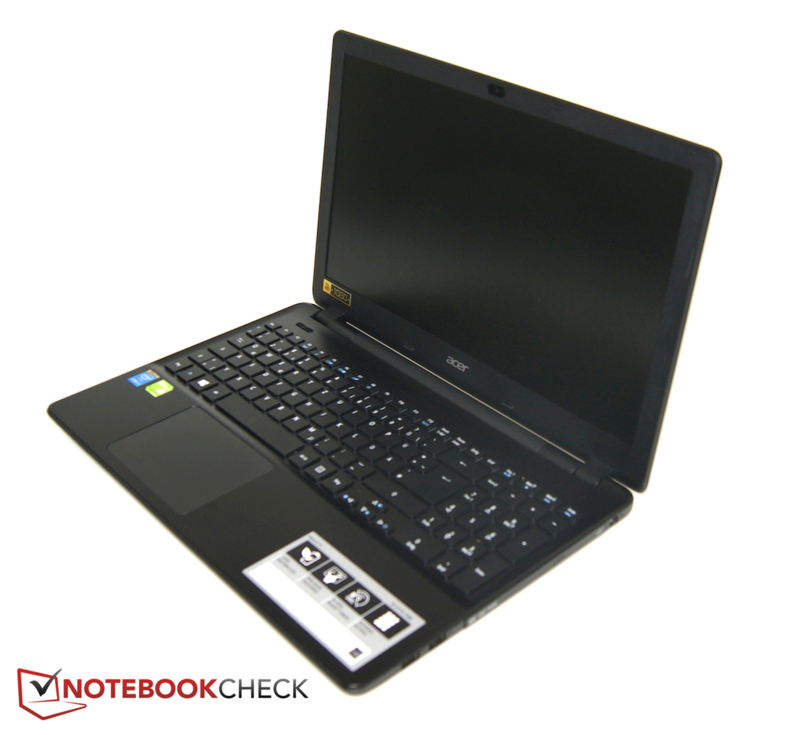 Acer's 15.6-inch laptop has enough computing power for both routine use and computer games. The long battery life also allows for on-the-go use. Our review sample currently has a price tag of around 650 Euros/740 USD. 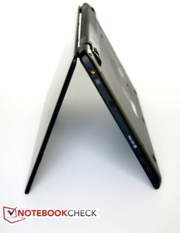 Acer offers many other configurations. The priciest model (the E5-571G-795A) sells for approximately 750 Euros/854 USD. 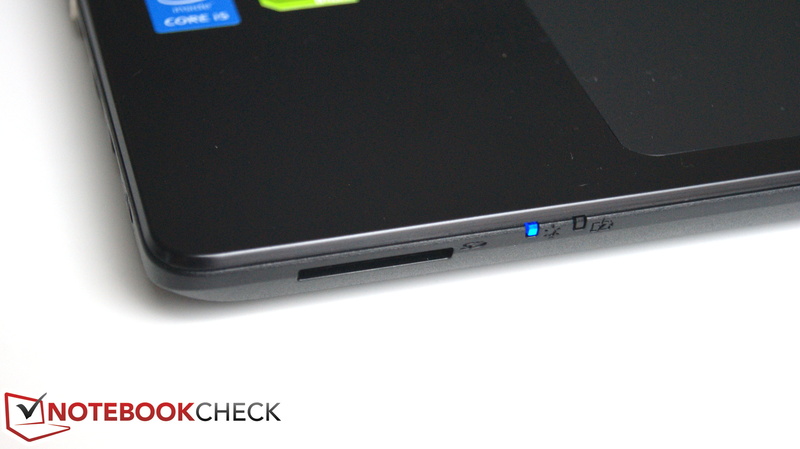 It features (with the exception of its Core i7 5500U CPU) the same components as our review sample. 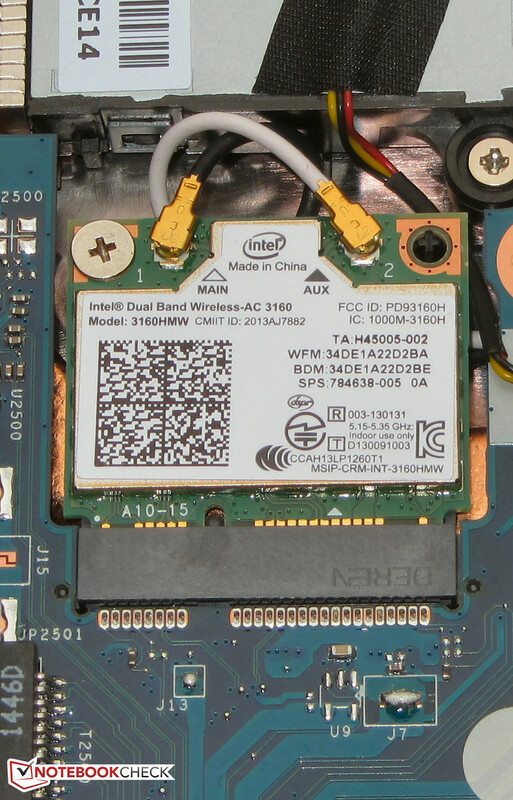 The Aspire's Intel dual-core Core i5 5200U (Broadwell) has a 15 watt TDP like its Haswell precursors and supports hyper threading (two threads can be processed per core). We ran Cinebench CPU benchmark tests at full clock speed in AC mode. The CPU operates at a base speed of 2.2 GHz, which can be boosted to 2.5 GHz (both cores) and 2.7 GHz (one core) via Turbo. It ran at 2.2 GHz in battery mode. As the processor's name suggests, it is the successor of the Core i5 4200U (Haswell). The Core i5 5200U clocks at a higher base speed (1.6 GHz vs. 2.2 GHz) and higher turbo levels (2.3 GHz vs. 2.5 GHz; 2.6 GHz vs. 2.7 GHz). These speeds, in conjunction with the improved Broadwell architecture, leads to a higher computing performance than the Core i5 5200U. The benchmarks we performed show a 5 to 20 percent advantage. This advantage is greater in multi-thread applications than in single-thread applications. The system ran smoothly, and we did not encounter any problems. Its PCMark benchmark scores are good and are roughly on par with the scores of Acer's Haswell processor-equipped Aspire E1-571G-536E. 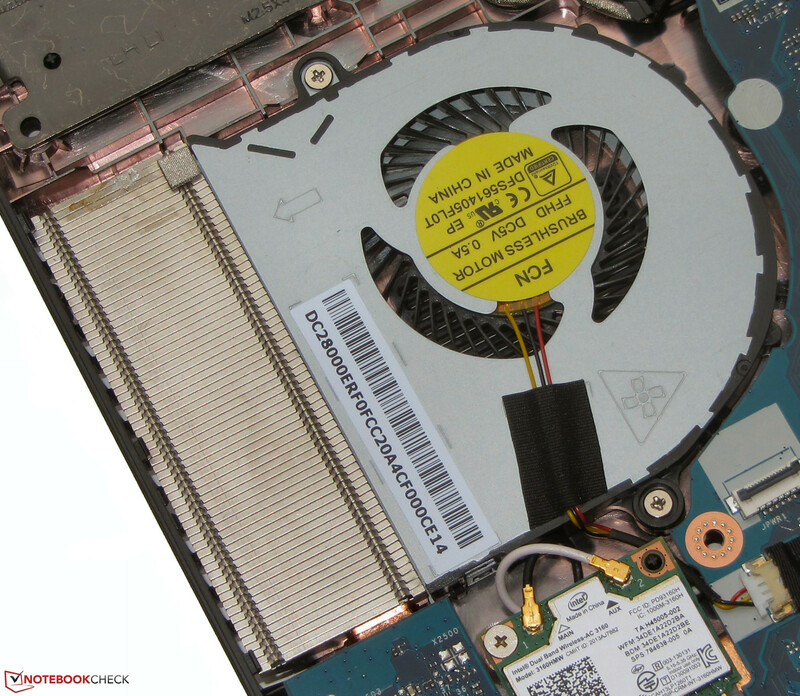 Our sample's stronger Broadwell processor does not provide much of an advantage in everyday use. Its benefit would be more noticeable in very performance intensive applications or when combined with an installed solid state drive. Aspire owners will not be looking for more storage anytimr soon. Acer outfits its E5-571G with a 1 TB Toshiba hard drive that spins at 5400 revolutions per minute. Crystal Disk Mark recorded a read speed of 97.6 MB/s, and HDTune delivered an average transfer rate of 78.5 MB/s - both normal rates for a 5400 rpm hard drive. Two graphics cards are installed in the Aspire: Intel's HD Graphics 5500 graphics core and Nvidia's GeForce 840M GPU. They create a switchable graphics solution (Optimus). The GeForce core is active in applications with high requirements, such as computer games. 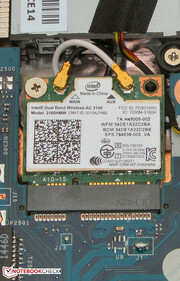 Intel's GPU requires little energy and is therefore enabled in routine use and in battery mode. Switching is automatic, but the user can always intervene and change the assigned core for an application. The GeForce GPU is a mid-range model. It supports DirectX 11 and clocks at a base speed of 1029 MHz. Its speed can be boosted to 1124 MHz via turbo. The 3DMark scores for this configuration are on par with those of comparable laptops, such as Asus X555LN-XO112H and the E5-571G's sister model. 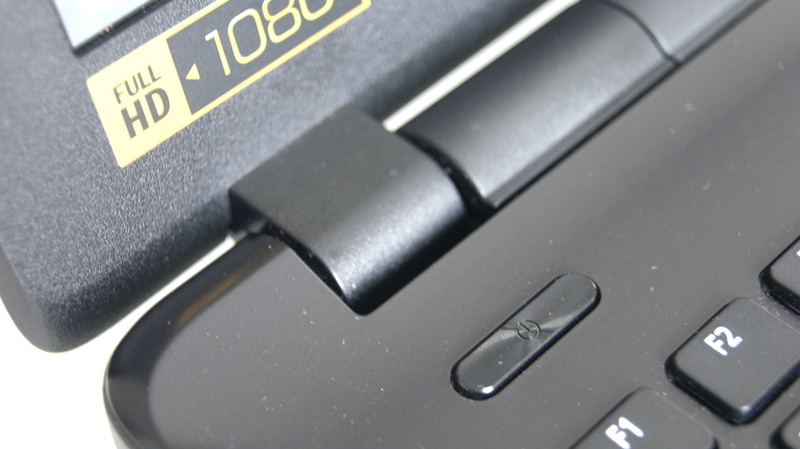 An all-round laptop is expected to render computer games. The Aspire is capable of this. The computer can smoothly display many up-to-date games in HD resolution (1366 x 768 pixels) using medium and, sometimes, high quality settings. Users who value Full HD that will have to find another laptop: the Full HD screen can only be fully used in a few games because the installed hardware can reproduce only a few games in Full HD resolution. Models with a GeForce GTX 850M or GTX 860M core would be recommended for gamers who demand full HD. However, devices with this configuration are correspondingly more expensive. 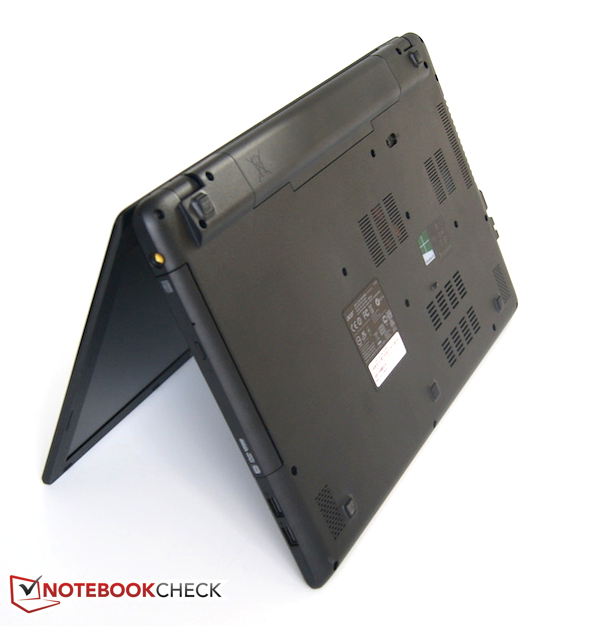 For example, the Lenovo Y50 with a GeForce GTX 860M starts at 800 Euros/910 USD (without an operating system). The Aspire is almost noiseless throughout the entire load range. Its fan permanently spins at a low speed in idle mode, but the hard drive's noise drowns it out. A virtually silent operation can be achieved by replacing the hard drive with a solid state drive. The fan does not speed up excessively during load. We measured a noise level of 37.8 dB - a very good rate. We are used to rates of at least 40 dB from laptops in this performance category (e.g., rivals Toshiba's Satellite S50-B-12U and Asus' X555LN-XO112H). 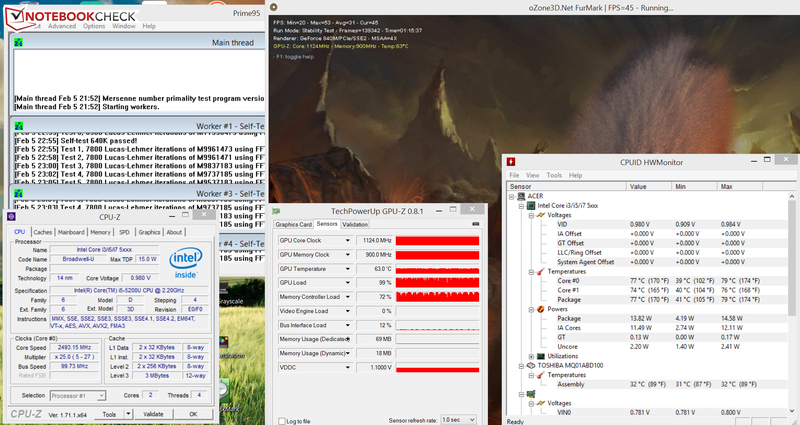 The Aspire's graphics core performed the stress test (Prime95 and Furmark, both run for at least one hour) at 1124 MHz in both AC and battery mode. The processor clocked at 2.5 GHz in AC mode and 2.2 GHz in battery mode. The Aspire does not get particularly warm. Forty degrees Celsius was only surpassed in three measuring spots during the stress test. The Aspire's power consumption is, for the most part, on par with contenders like Toshiba's Satellite S50-B-12U and Asus' X555LN-XO112H. Both proved slightly more frugal in idle mode than the Aspire. 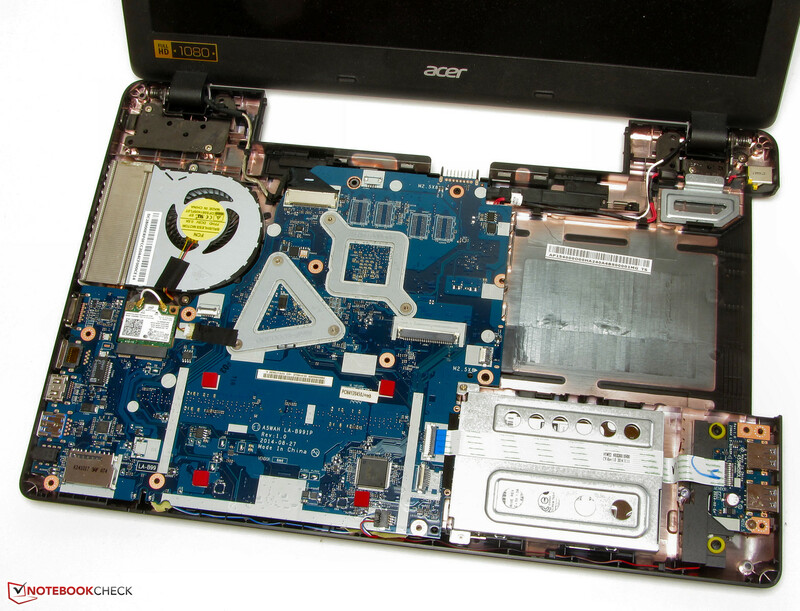 This was not surprising: these laptops sport Haswell processors, and are known for very low idle consumption. On the other hand, the Aspire has a slight lead in load. All three laptops have an inconspicuous power requirement for their performance category. The Aspire's battery lasted 13:15 hours in idle mode. Toshiba's Satellite S50-B-12U (8:10 h) is drained much faster. 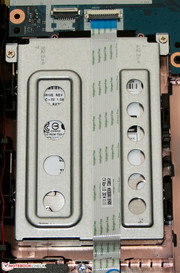 Idle mode was tested using Battery Eater's Readerwith the screen set to minimum brightness, the energy saving profile enabled, and the radio modules off. The Aspire shut down after 2:52 hours of load, defeating the Satellite (at 1:56 h) again. We used Battery Eater's Classic test for load runtime using maximum screen brightness, the high-performance profile, and enabled wireless modules. Acer's laptop stopped the real-world Wi-Fi test after 6:52 hours. The Satellite (5:06 h) and Asus X555LN-XO112H (4:16 h) cannot compete with that. Websites were opened automatically every 40 seconds with the energy saving profile enabled and a screen brightness of approximately 150 cd/m² in this test. We tested the video playback time by running the short movie Big Buck Bunny (H.265 encoding, 1920 x 1080 pixels) in a loop with the wireless modules disabled, and the screen's brightness set to approximately 150 cd/m². The Aspire lasted 7:04 hours. We did not perform this test with either contender. Acer's Aspire E5-571G-620X is a well-conceived, 15.6-inch all-rounder. Its computing power is more than enough for routine use, and can also render games smoothly without producing a lot of noise. 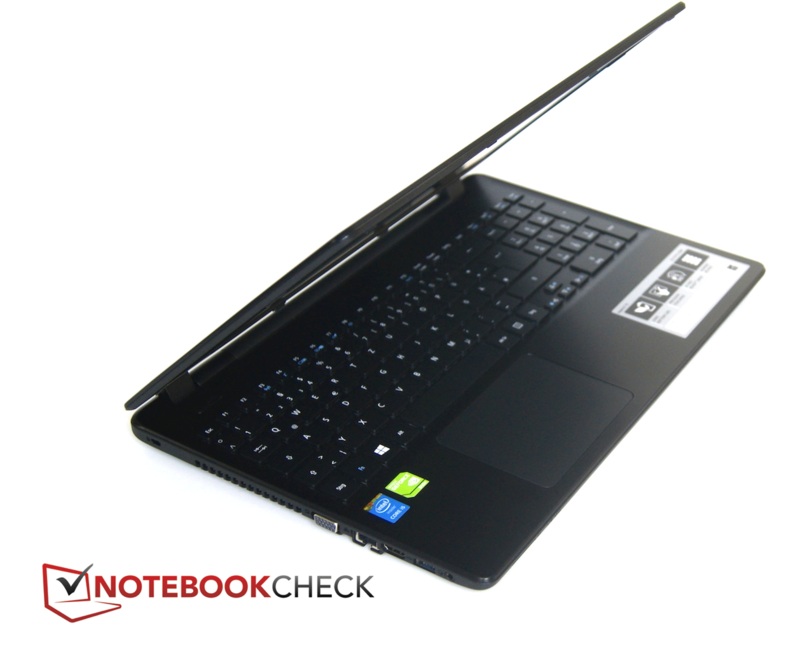 It provides decent input devices and boasts a very good (i.e., ultrabook runtime standards) battery life. 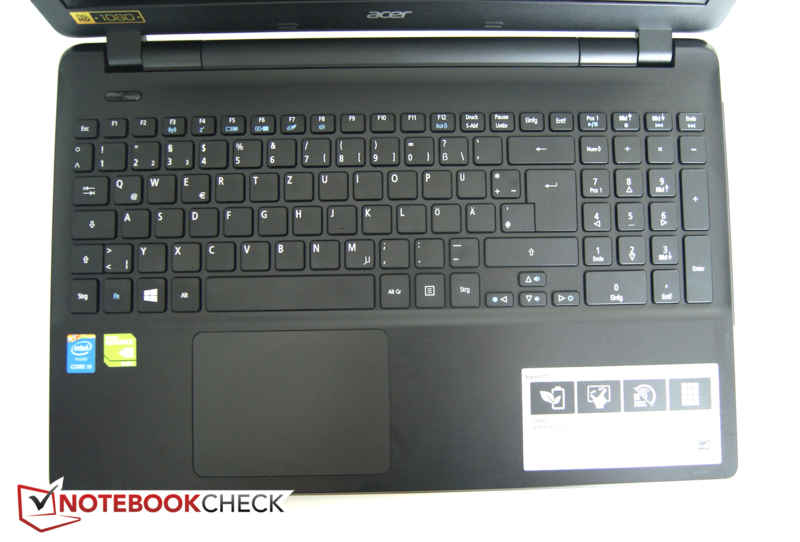 We have to criticize Acer for the Full HD screen that serves up low brightness and contrast. We are also unimpressed with the lack of a maintenance cover: the entire laptop casing has to be opened to replace the hard drive. The E5-571G-620X is approximately 650 Euros/740 USD, but lower priced versions are also available: for example, the E5-571G-539F (Core i5-4210U, GeForce 840M, Full HD screen, 500 GB SSHD, 4 GB of working memory, no Windows operating system) is currently available for about 500 Euros/570 USD. 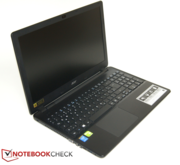 In Review: Acer Aspire E5-571G-620X. Test model courtesy of Notebooksbilliger.de. The casing is comprised of black plastic. 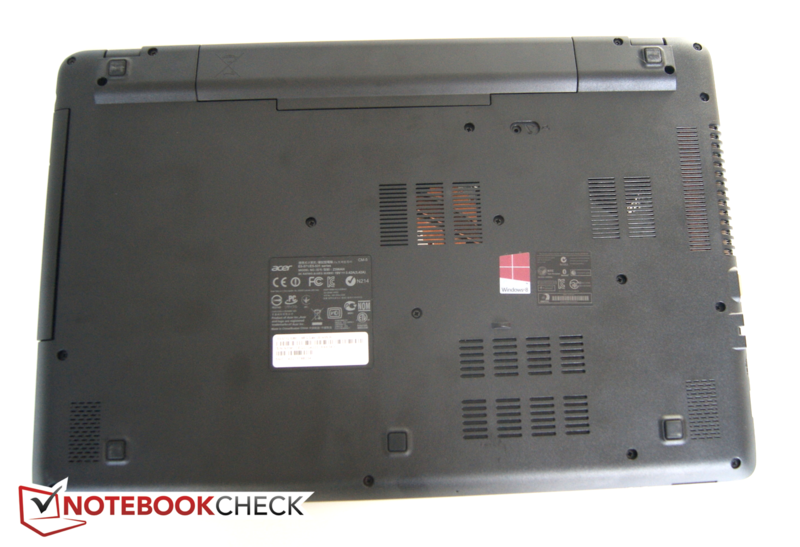 The laptop features a matte, Full HD screen. The memory card reader is on the front. 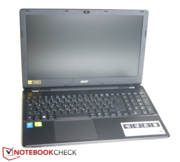 Aspire E5-571G - input devices. ...makes it possible to lift off the base unit's upper side. 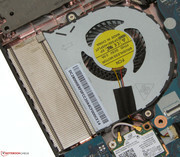 The user can then access the fan, hard drive, and Wi-Fi module. 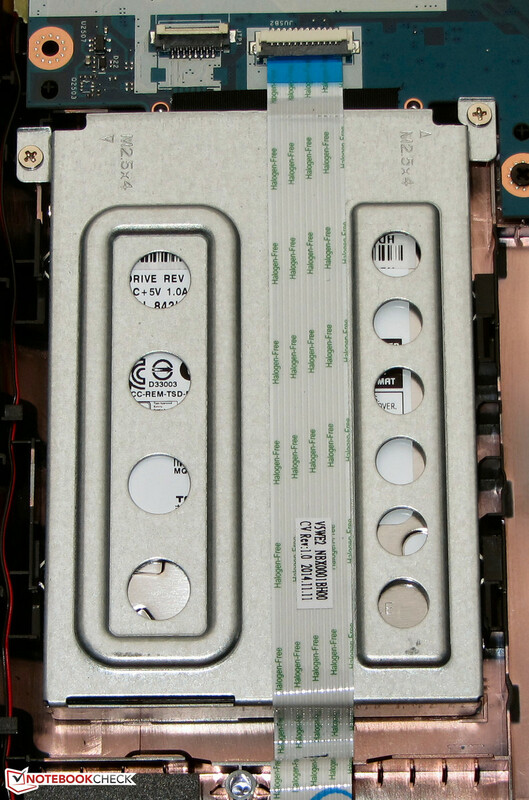 The motherboard would have to be removed to access the working memory. The fan can be cleaned. A brighter, higher contrast IPS screen.